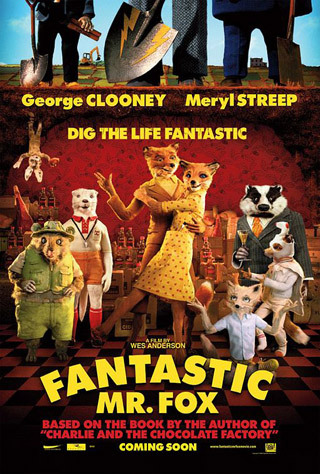 George Clooney, Meryl Streep, Jason Scwartzman and Bill Murray lend their voices to the 2009 stop motion animated adventure from director Wes Anderson. Watch the movie trailer for Fantastic Mr. Fox below. The movie tells the story of the clever Mr. Fox (Clooney), his adoring wife (Streep), and their eccentric son Ash (Schwartzman), who outsmart three of the nastiest, ugliest, and ultimately dumbest farmers ever to raise poultry. Based on the beloved, best-selling book by Roald Dahl (Charlie and the Chocolate Factory). MPAA Rating: (PG) for action, smoking and slang humor. FANTASTIC MR. FOX is director Wes Anderson’s first animated film, utilizing classic handmade stop motion techniques to tell the story of the best selling children’s book by Roald Dahl (author of Charlie and the Chocolate Factory and James and the Giant Peach). Mr. and Mrs. Fox (Clooney and Streep) live a happy home life with their eccentric son Ash (Jason Schwartzman) and visiting nephew Kristopherson. That is until Mr. Fox slips into his sneaky, old ways and plots the greatest chicken heist the animal world has ever seen.